Spain is a beautiful country that is almost completely surrounded by water. For thousands of years, one of Spain's greatest sources of food has come from the sea. Many of the typical foods of Spain include "mariscos" or seafood. The various cuisines of Spain are so vast due to the differences in geographical locations and culture. Seafood iss seen throughout many different typical foods of Spain. We see then especially present in the paella. Also, both Spain's culture and food have a presence of Greek and Roman influence. We see this through many different dishes. 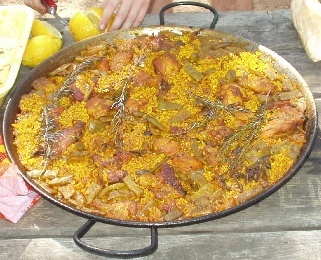 Paella is a traditional dish that was created in Valencia. 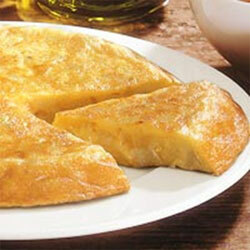 It is considered as one of the most popular and famous foods in all of Spain. Paella is a rice dish that is typically made up of rice, vegetables, meat, beans and spices. The three main types of paella are the traditional paella, with meat, rice, beans, and spices; the second is seafood paella which substitutes seafood or “mariscos” for the meat; the third type is the mixed paella that contains both seafood and meat. Although there are 3 main types of paella, there are many different variations and people can pick and choose what ingredients they like. Paella is served in a special pan called a paellera. Paelleras are flat, metal pans that have two metal handles. It is both served and cooked in a paellera, and usually people eat out of the paellera. Like tapas, paella is social dish because it is served out of one communal dish and invites everyone to sit around the paellera together and socialize. Tortillas de Patatas is another traditional dish of Spain. Tortillas de Patatas can be served as either a main course or appetizer. This meal has a cake-like consistency and is made basically from fried potatoes, eggs, olive oil, and onions. Like the paella, and tapas, this dish can be made in serveral different variations. One special ingredient that makes this plate taste so yummy is the olive oil. Tortillas de Patata is very filling and although it is typically served as a main course, it can be cut up into small "bocadillos" or sandwiches and served as snacks or appetizers. 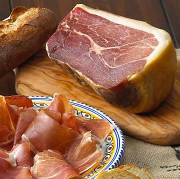 Jamón serrano is a traditional food of Spain. It is known throughout the world and many other countries attempt to make their own versions, but nothing is quite the same as the origanl Jamón serrano that originated in Spain. Making Jamón serrano is a long, slow process, taking up to 18 months. First, the ham is cut and saturated in salt for a few weeks,in order to take out any moisture that is left inside; then the ham is placed is a dry, elevated area for up to 18 months where it is dried and cured, leaving the ham with a lot of flavor. Jamón serrano would be comparable to country ham made in the United States but is known to be much more flavorful and less salty. This meat is one of Spain's most traditional foods and is used in many Spanish recipies and dishes including tapas.